I am so excited about today's post that I have been struggling to not show you every single detail along the way in order to still keep some element of surprise. 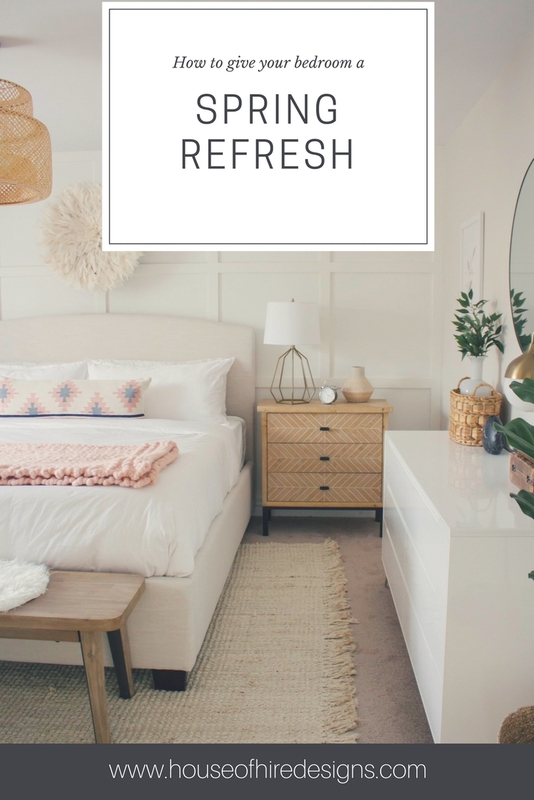 So, you all know how much I love a good Homesense find so I am absolutely thrilled to be partnered with them for this master bedroom refresh. 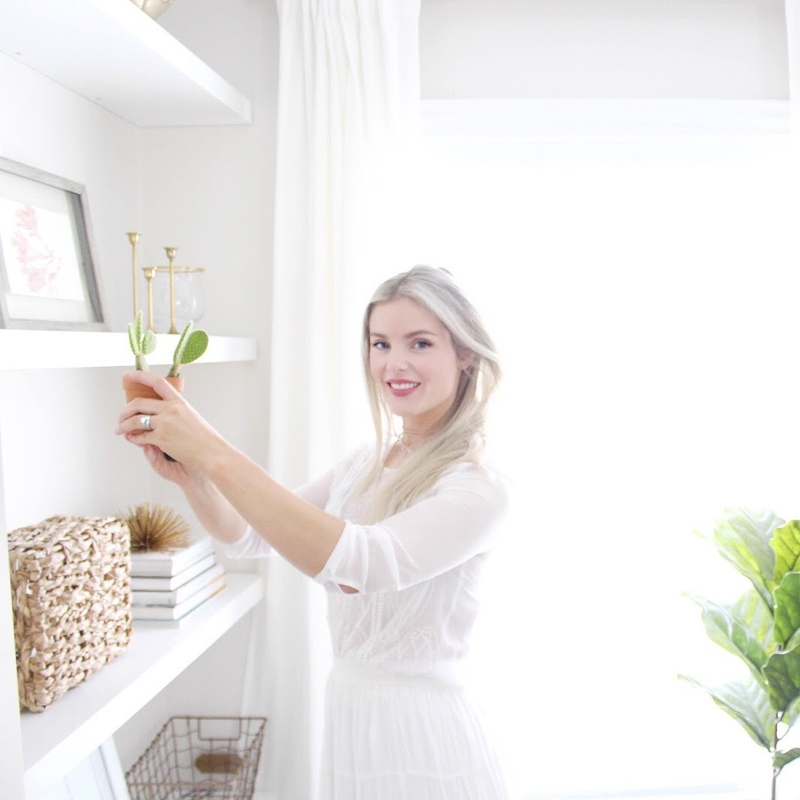 With spring hopefully right around the corner I always find myself wanting to freshen things up and lose some of the winter heaviness that we can bring into our home design. 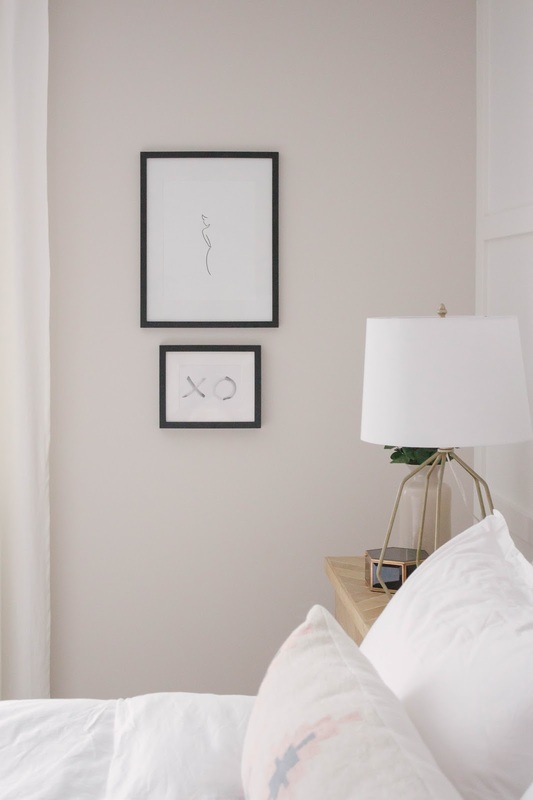 However, it is still going to be Winter for a little longer and we are often spending more time inside so it's a great opportunity to switch things up in your home and give your space a new look. 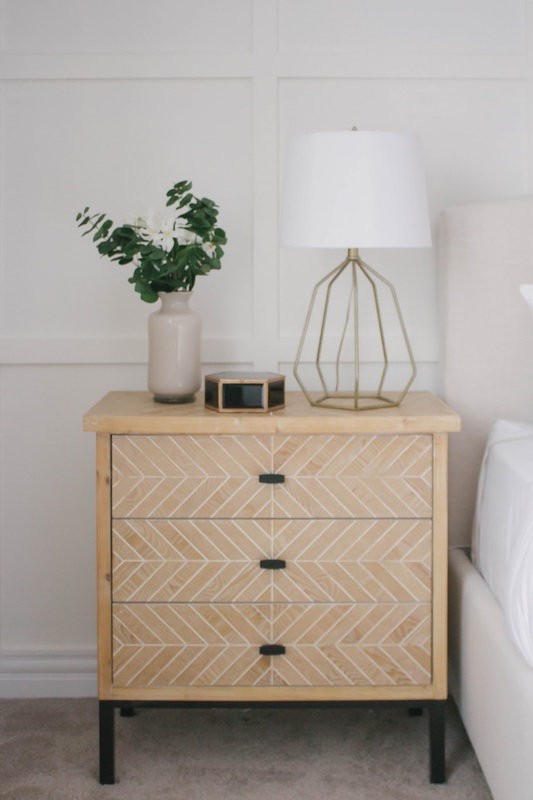 One of the main things I wanted to update in our master bedroom was the nightstands. Although I enjoyed the ones we had, we got them many years ago and our needs have changed since then. I really wanted something with a bit more storage. I spend a lot of time working in the bedroom and also reading and wanted something that could house a lot of those items when they weren't in use. 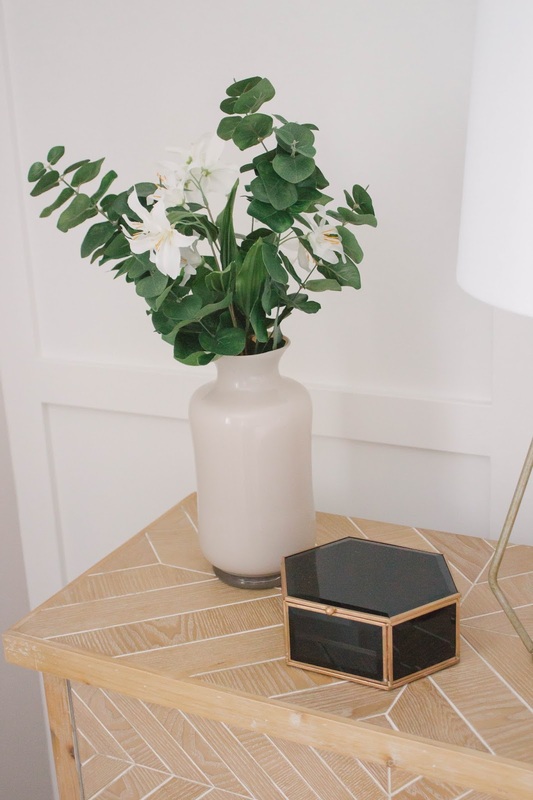 Well friends Homesense did not let me down, I just about passed out with excitement when I spotted these two wooden nightstands with a black metal base and this beautiful white carving detail throughout. I am not remotely exaggerating when I say these are my DREAM nightstands. The nightstands also feel so much more size appropriate for our king sized bed, so naturally with nightstands checked off the list I needed some new lamps. 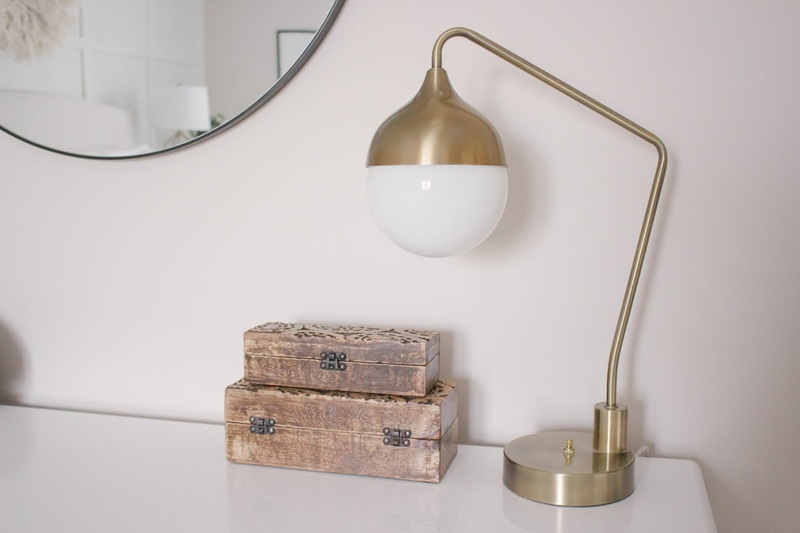 Lighting is such an important part of any room in your home and although I adored the brass ones we had I wanted something that would give a bit more light and was larger in size. 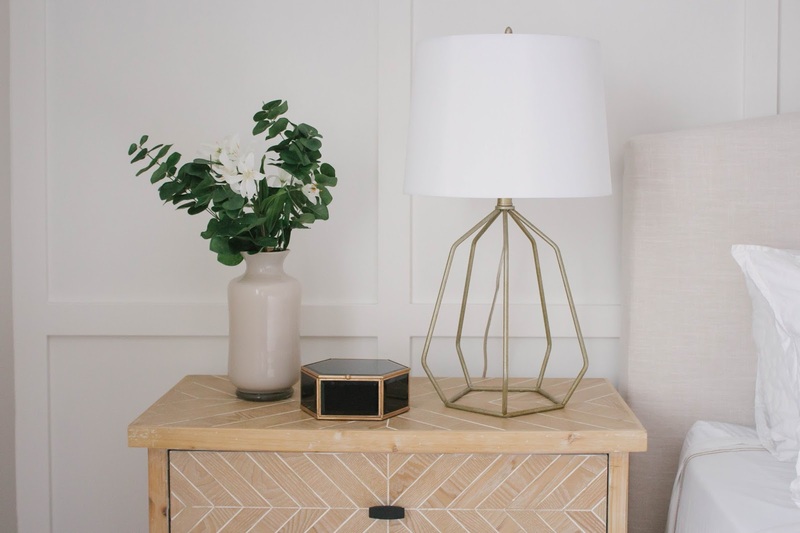 I spotted these brass geometric table lamps with a crisp white shade and knew they would be perfect. Their scale was just right for the nightstands and they felt light and airy in appearance. Most importantly I feel like they really compliment the nightstands and don't compete with the beautiful detailing in the wood. Shall we talk about the bed? 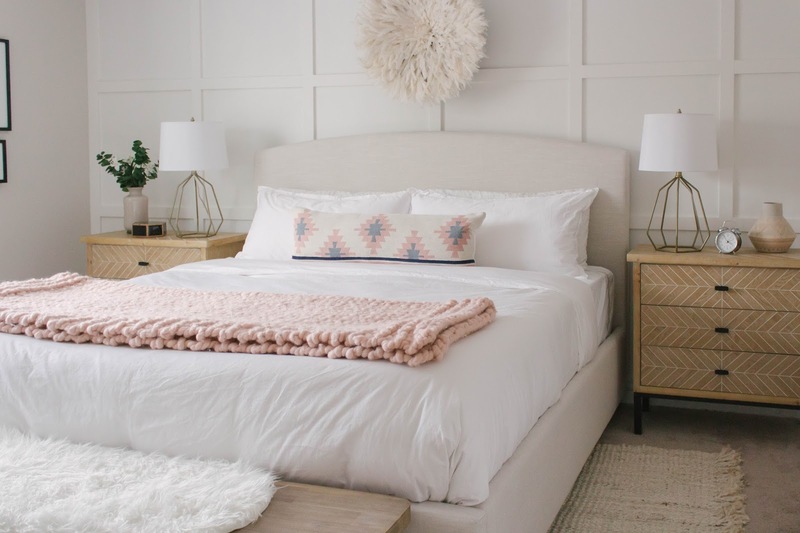 In my opinion there is nothing better then crisp white bedding, it just freshens up a room like nothing else! 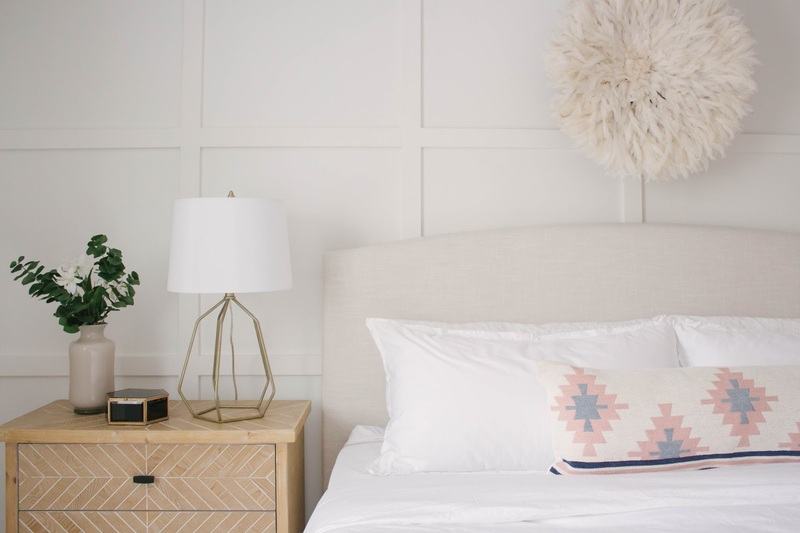 I knew I wanted a new white duvet cover set and you just can't beat the prices on bedding that Homesense has- this whole king set was under $100. 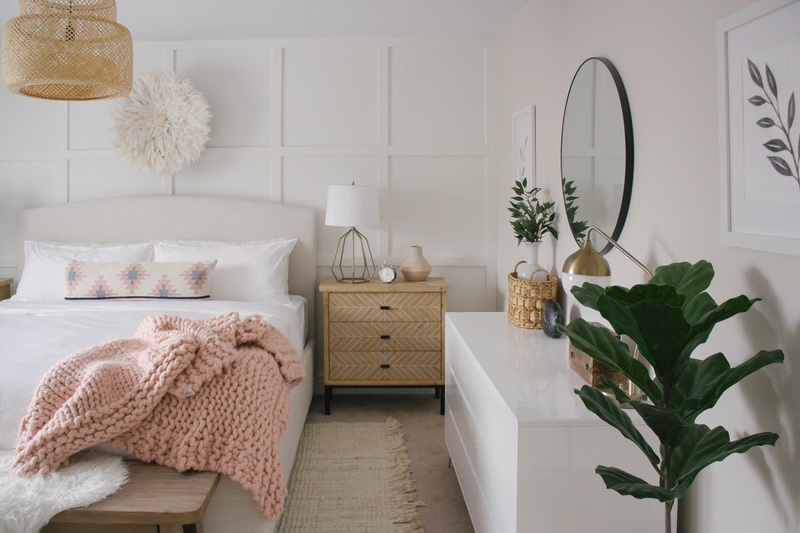 I really wanted to keep accent pillows to a minimum this go around in the bedroom because often I am making the bed in a hurry and I love the simplicity of just throwing one oversized lumbar on. The tribal pattern on this pillow just gives me life! 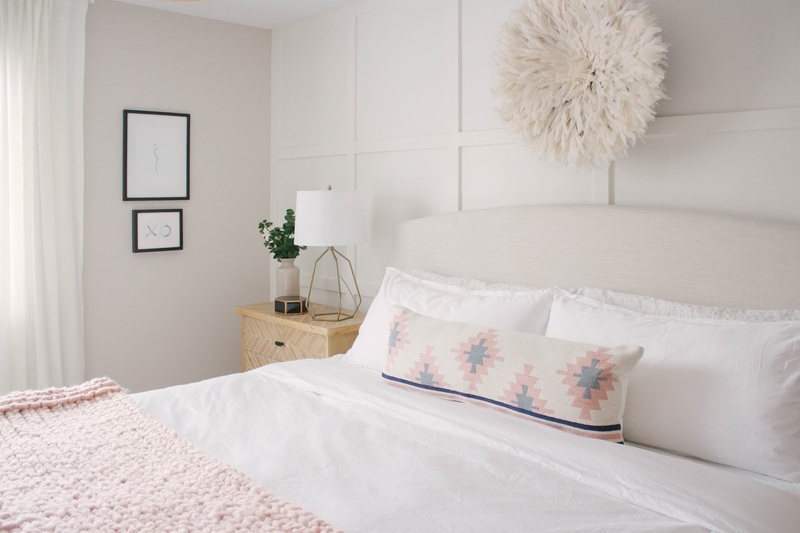 The blushes paired with the blues is such a classic combo and I love how it feels feminine and masculine at the same time- perfect for the master bedroom right?! And of course I can't talk about the bed and not mention that stunner of a blanket. This oversized chunky knit throw was just waiting in the textile section for me and I swooped it up so quick I think I startled the person standing behind me. 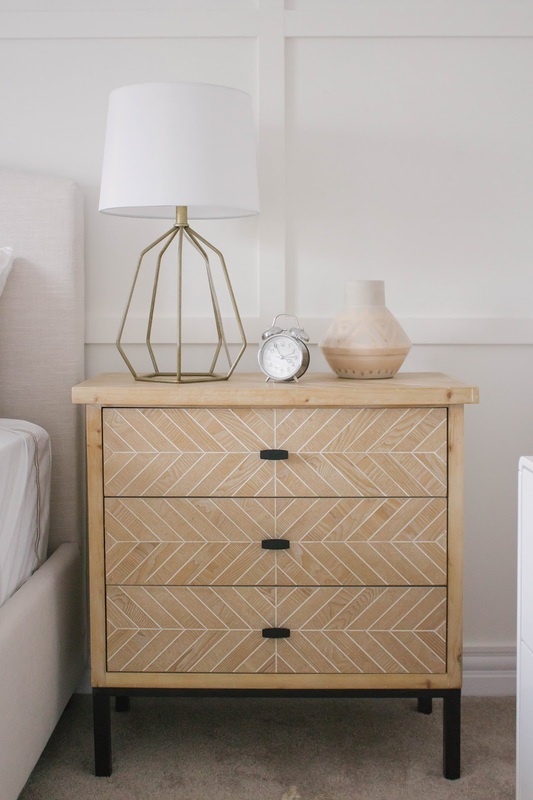 Ok, so you know I always say design is in the details and all the decor on both nightstands is from Homesense along with the ones on the dresser (minus the diffuser). 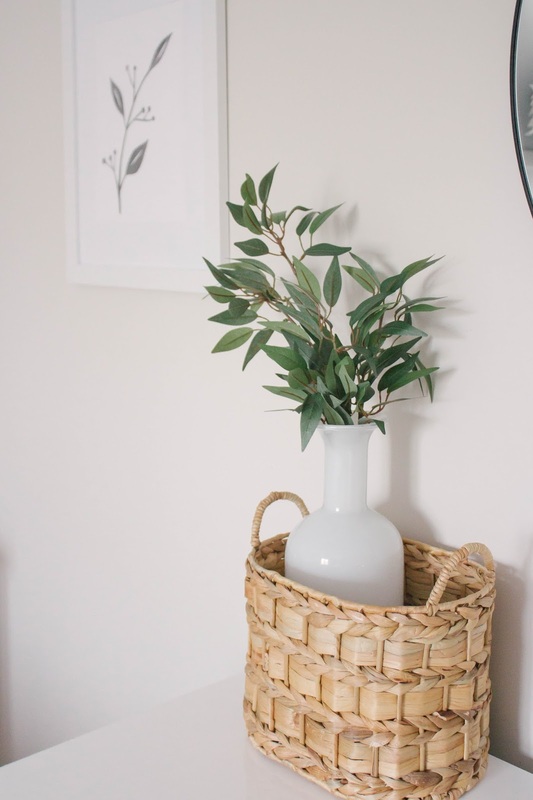 I used one of our old lamps on the dresser as well and brought in lots of warmth and texture with baskets and greenery. I wanted to freshen up the art in the space so I added two frames on the wall where I used to have my fig tree and swapped out the art in the other frames with some pretty decals I had left over from a project with Urban Walls. I am really loving how the botanicals look framed and they are a nice classic watercolour so they don't compete with anything else in the room. Well there you have it! 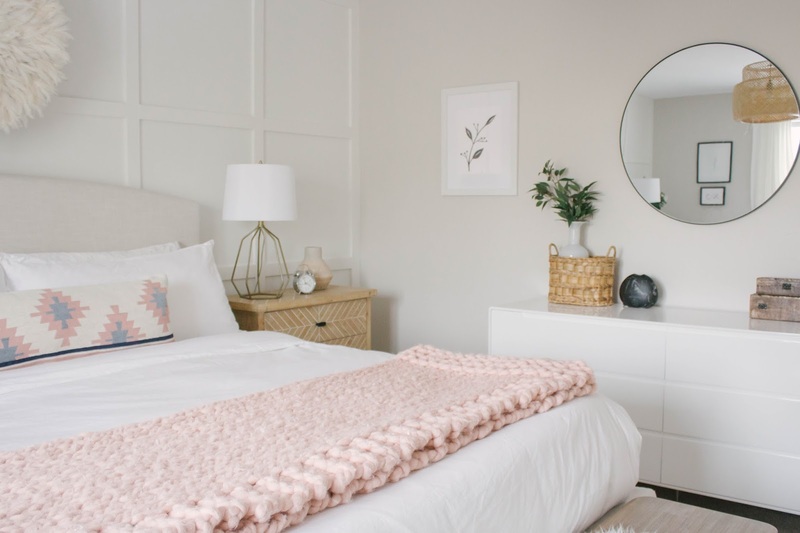 A bedroom refresh that involved keeping most of my existing large pieces of furniture and just swapping out accessories and textiles. I am really loving how the wood brings in great warmth and this room now feels complete! 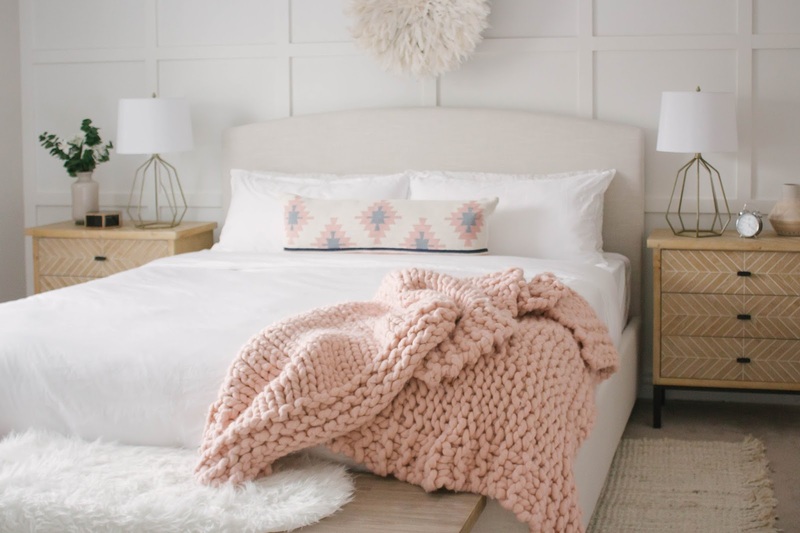 I hope it's inspired you to cozy up a room in your home. 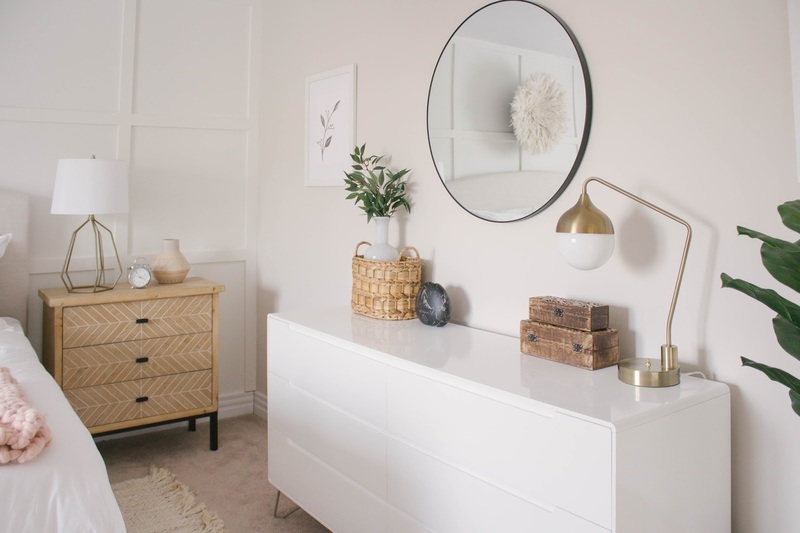 This post was in partnership with Homesense Canada. As always all opinions expressed are my own and thank you for supporting this blog.